When it comes to space planning in the hospitality industry, frameless glass wall systems can optimize space within very elegant architecture. Our hotel clients tell us that every square meter counts. While the design specifications for private rooms and common areas vary, our goal is always to create a perfect marriage of functionality, design and comfort. So how do we do this at Klein? The solution is often found by incorporating sliding glass wall systems into the design. It becomes easy to create bright and flexible spaces by simply installing or removing partitions. 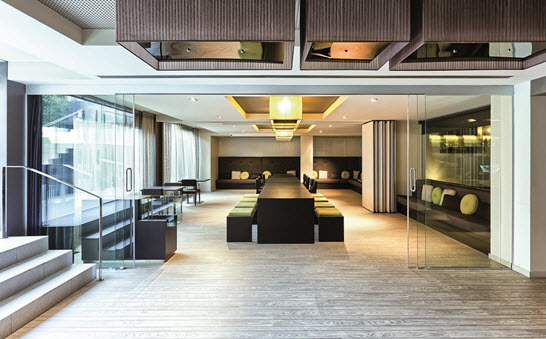 “Frameless” gives hotels the ability to satisfy specific space requirements, allowing their guests’ needs to essentially direct the design – but in a most elegant manner. All hotels want to make a positive first impression – and luxury hotels want that impression to deliver a big impact the moment a guest walks through the entrance to its lobby or its guestrooms. Sliding systems allow for new types of entrances: corner doors are an imaginative alternative for entrances to bedrooms or bathrooms, and they allow for a wide opening at a right angle, free of any obstructions on the floor. Hotels often need to combine two adjacent spaces or temporarily reorganize a large room according to traffic flow or for a special event. We often recommend the telescopic Extendo to accomplish this goal. Extendo’s synchronized mechanism can effortlessly open and close up to four glass panels at a time, using a floor track-free opening of up to 16 inches wide. Maximum flexibility, guaranteed accessibility – features our hotel clients love. To ensure a pleasant stay for its guests, hotels seek optimal space organization in bedrooms and suites. As with lobbies and conference rooms, sliding glass doors play a crucial role in design. Klein’s Rollglass and Unikglass products provide options for both fixed and mobile partitions to divide room space. Surprised at this flexibility? Many are, as sliding glass systems are often more frequently considered for the public spaces of hotels. However, Klein’s glass partition products have proven themselves in hotel guestrooms, such as the Olivia Plaza Hotel, as well as our next category for usage: bathrooms. Space. Privacy. Aesthetics. Hotels demand all three when it comes to defining bathroom space. The use of sliding doors in showers and bathrooms emphasizes the aesthetic aspect, while simultaneously saving space and ensuring privacy thanks to the specially treated glass and the minimal separation between fixed and mobile panels. As with bedrooms, products like Klein’s Rollglass give hotels flexibility to opt for a single door or combinations of various fixed and sliding glass panels. The upper track can be easily installed on the wall or ceiling or conveniently hidden in the drop ceiling so that it blends in with the decor. No matter the space – entrance, lobby, conference room, guest room or bathroom – hotels find their solutions for elegant space design through our frameless glass wall systems. Take a look at the many examples of Klein installations in hotels around the world. The Marriott Hotel CT, the Intercontinental in New York, the Four Seasons in Dubai, and the Ushuaia Beach Hotel in Ibiza are all points of reference that illustrate the excellence of KLEIN installations. Klein USA, Inc. is a global leader in high-quality frameless glass wall systems uniquely designed to provide the hospitality industry with the most innovative solutions, enhancing both space and light sharing. Use of Klein’s frameless sliding doors imparts a clean, modern look to any hospitality application.